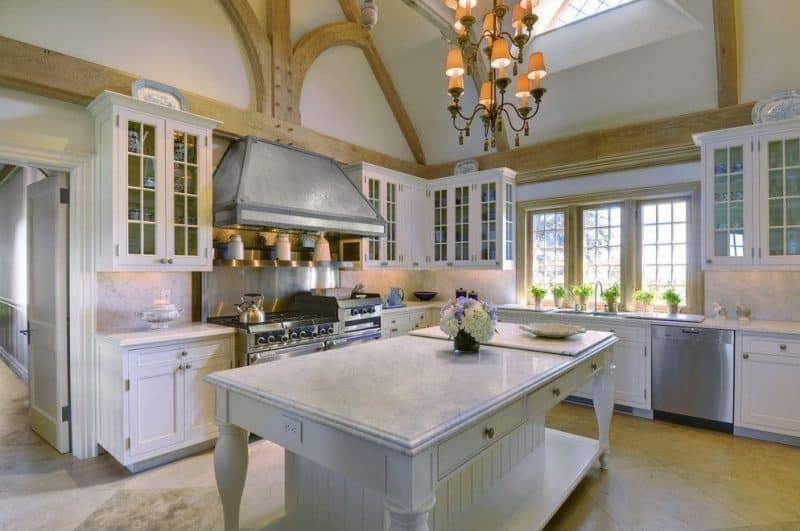 Bonjour and welcome to the Art of the Home gallery of kitchens with glass cabinets! We hope you will find lovely ideas to make your home even more beautiful than it already is. We all need a place in the kitchen to store our day to day dishes and other kitchen accessories for easy access. Whether you love colorful or classic white dishes, why not use your cabinetry to display the treasures that accompany your daily life. Kitchens with glass cabinets can let you do that. You can have all your cabinets faced with glass or have a mix. We actually prefer that latter option…there are things in the kitchen you just don’t want to parade! As you can see from the kitchens with glass cabinets below you have so many options of glass and decorative wood accents. So whether you’re into a classic look, a rustic chic, or a more contemporary feel, there are many ideas of kitchens with glass cabinets that can fit your style…such fun deciding what to pick! So come on, we’ve handpicked amazing kitchens with glass cabinets for you. We sure hope you’ll find one that makes your heart skip a beat! Enjoy and beautiful day to you! The Little Plus: the high ceiling beam woodwork of this airy kitchen. Notice the interesting use of exposed beams — they are used as decorative wall moldings and paired with large flat rectangular crown molding in the same stain Also, the glass cabinet doors are made in the same pattern as the 3-panel window above the sink as if they were an extension of this large window. And, how about the color palette with its the predominantly white, silver gray, soft browns and indoor plants accents…seem plucked out of a home décor magazine. The Little Plus: the sculptural bell jar lanterns that appear like art pieces in a gallery. And notice the glass cross mullion doors of the upper cabinets with a practical drawer underneath. 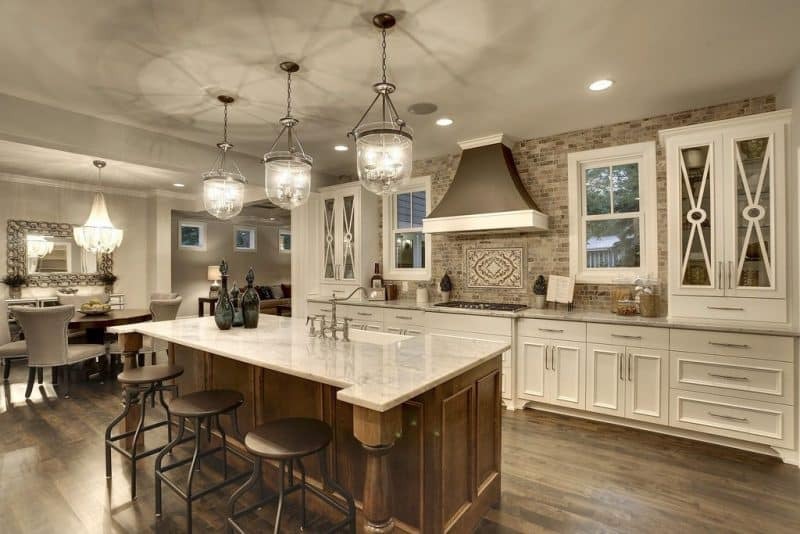 Last but not least, the marble top of the kitchen island is a sophisticated companion to the white cabinetry and its base medium brown stain call back the darker hues on the brick backsplash. The Little Plus: the single handle vintage kitchen faucet that adds a classic retro feel. 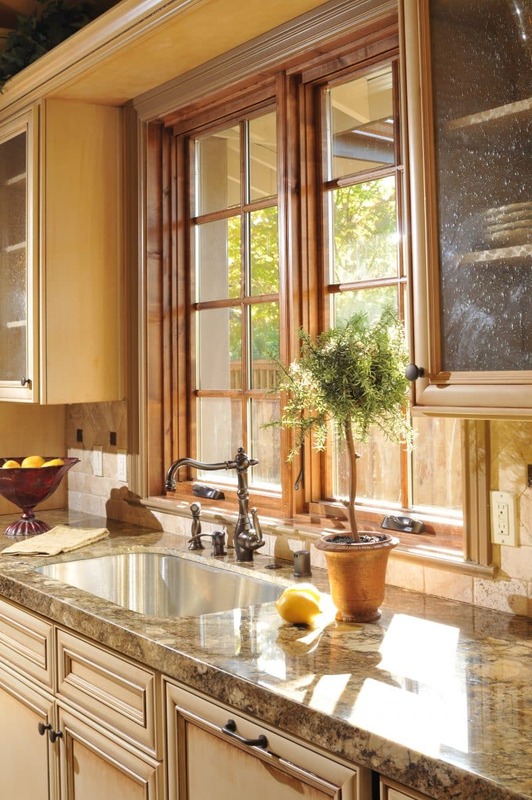 So love this big window by the sink that let the sunlight pour in. Take a look at how the light through the window casts some shadows on the granite countertop creating a chiaroscuro effect much like Vermeer’s still life paintings. 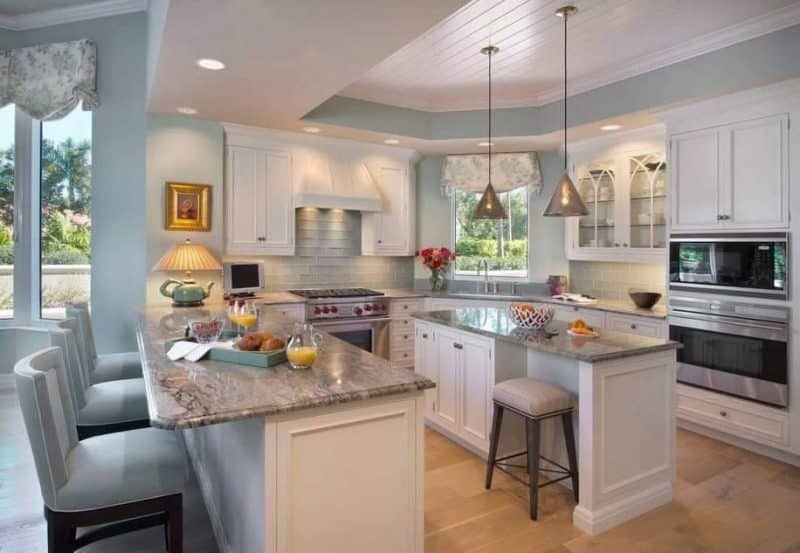 And notice how the glass cabinets, with wood moldings and an etched surface of the glass cabinet, look like a gentle drizzle, complete this cheerful and painterly kitchen corner. The Little Plus: the delicate mix of warm and cool tones. The soft, powder blue backdrop (including the subway tiled backsplash and a cute teapot lamp!) 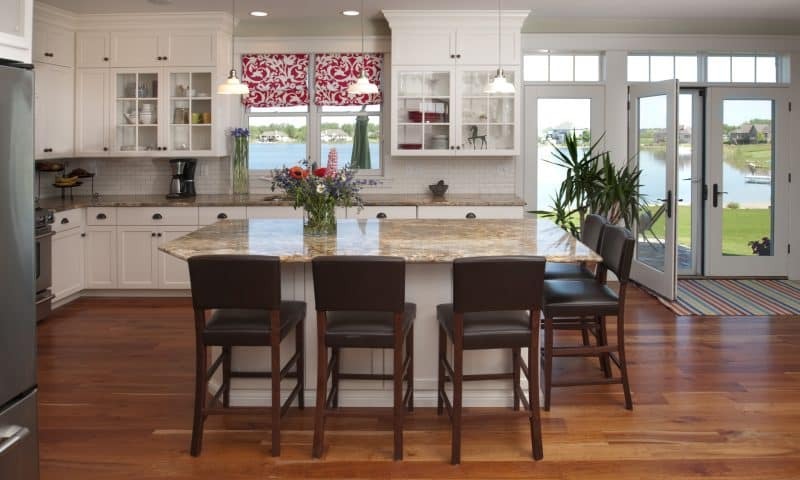 melds well with the white cabinetry, the grays of the countertops, and the natural wood finish of the hardwood floor. Also, notice the mullion glass cabinets, with a muted classic arch design — they complete nicely the “classic cool” appearance of this white kitchen.